Exhaustive events : A set of events is said to be exhaustive, if it includes all the possible events. For in tossing a coin there are two exhaustive cases either head or tail and there is no third possibility. Mutually exclusive events : If the occurrence of one of the events procludes the occurrence of all other then such a set of events is said to be mutually exclusive. Just as tossing a coin, either head comes up or the tail and both can't happen at the same time, i.e., these are two mutually exclusive cases. Equally likely events : If one of the events cannot be expected to happen in preference to another then such events are said to be equally likely. For instance, in tossing a coin, the coming of the head or the tail is equally likely. 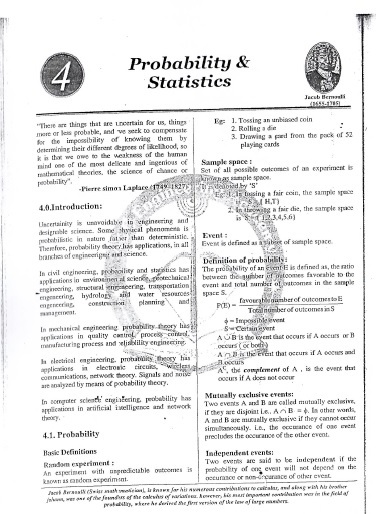 Random experiment : Experiments which are performed essentially under the same conditions and whose results cannot be predicted are known as random experiments. e g., Tossing a coin or rolling a die are random experiments. Mathematicians have tried in vain to this day to discover some order in the sequence of prime A numbers and we have reason to believe that it is a mystery into which the human mind will never penetrate. 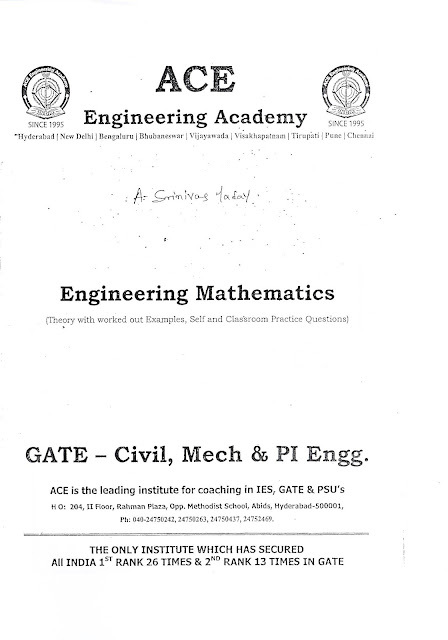 Introduction: Differential equations arise from many problems in mechanical bending of beams, conduction of heat, velocity of t. The chemical reactions etc. 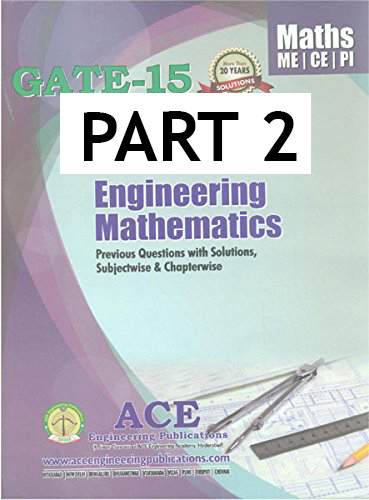 Differential equations are used to model the physical systems. The systems which change con time are called dynamic Systems. For example, models which describe heat transfer chemical engineering which depend on time, electronic circuits with time dependent current and voltages are dynamic systems. The phase A differential equation is an equation which involves differential coefficients or differentials. 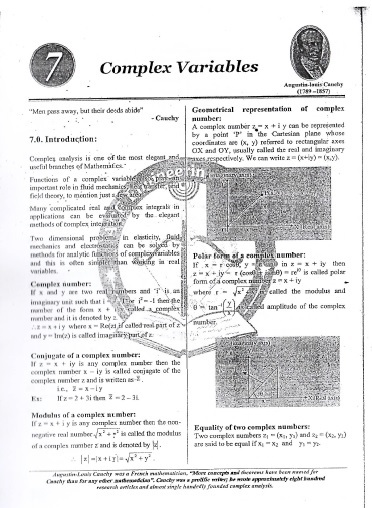 A partial differential equation is that in which there are two or more independent variables and partial differential coefficients with respect to any of them. 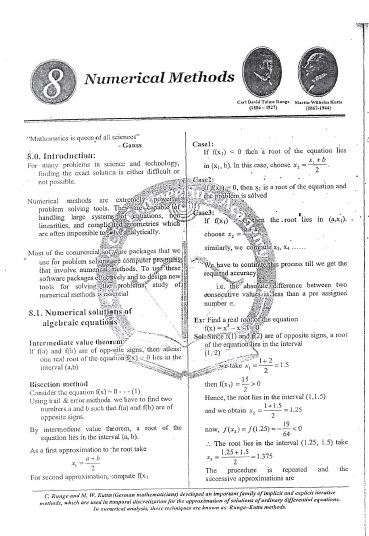 The degree of a differential equation is the degree of the highest derivative occuring in it, after the equation has been expressed in a form free from radicals and fractions as far as the derivatives are concerned. The study of a differential equation consists of three phases. Physical interpretation of the solutions. 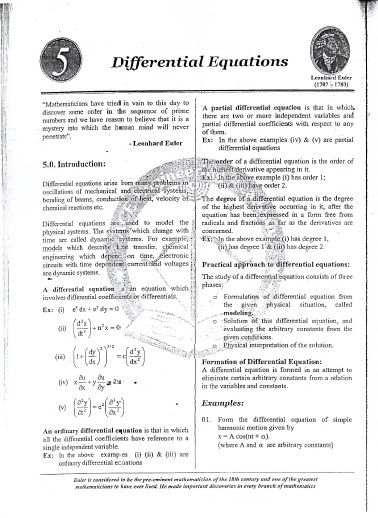 Solution of a differential equation : A solution if a differential equation is a relation between the variables which satisfies the given differential equation. The general solution of a differential equation is that in which the number of arbitrary constants is equal to the order of the differential equation. A particular solution is that which can be obtained from the general solution by giving particular values to the arbitrary constants. A singular solution is that which cannot be obtained from the general solution by giving particular values to the arbitrary constants. 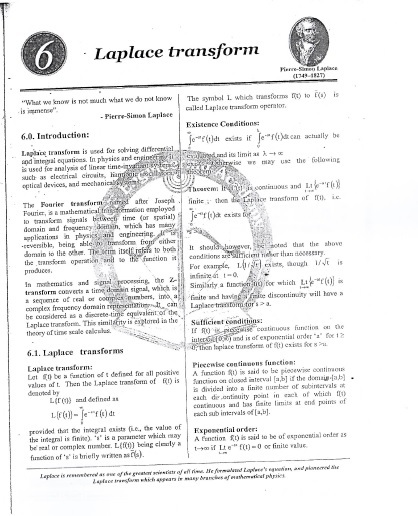 Introduction : Laplace transform is used for solving differential and integral equations. In physics and engineering, it is used for analysis of linear time-invariant systems such as electrical​ circuits, harmonic oscillators, optical devices and mechanical​ systems. The Fourier transform named after Joseph finite Fourier, is a mathematical transformation employed to transform signals between time(or spatial) domain and frequency domain, which has many applications in physics and engineering. It is reversible, being able to transform from either domain to the other. The term itself refers to both the transform operation and to the function it produces. In mathematics and signal processing, the Z transform converts a time domain signal, which is a sequence of real or complex numbers, into a complex frequency domain representation. It can be considered as a discrete-time equivalent of the Laplace transform. This similarity is explored in the theory of time scale calculus.